Born: 27 February 1748, Tensta, Uppland, Sweden. Died: 9 August 1820, Stockholm, Sweden. Anders Sparrman, Swedish physician and naturalist, was the son of Pastor Eric Sparrman and his wife Brita Hogbom. He enrolled in the University of Uppsala in 1757 and five years later started studying medicine. One of his teachers was the famous Swedish botanist C. Linnaeus the elder, while Carl P. Thunberg* was an older fellow student. From December 1765, when he was only 17, to August 1767 Sparrman travelled as ship's surgeon to Canton, China, with Captain Carl G. Ekeberg* and upon his return submitted a dissertation to Linnaeus entitled Dissertatio Academica sistens Iter in Chinam (Uppsala, 1768) - a pamphlet of 15 pages in Latin outlining his voyage to China. That same year he became a student member of the Swedish Chirurgical Society. After completing his medical studies in 1770, Ekeberg and Linnaeus arranged for him to visit the Cape of Good Hope as a naturalist. He arrived in Table Bay on the Stockholms Slott, a ship of the Swedish East India Company, on 12 April 1772. During his absence from Sweden the University of Uppsala conferred on him the degree Doctor of Medicine in December 1775. Soon after his arrival Sparrman spent a few days collecting plants and insects in the vicinity of Cape Town with Thunberg, who had arrived at the Cape four days after him. However, for most of that year he tutored the children of J.F. Kirsten in Simon's Town to make a living, collecting plants and insects in his spare time. In September he moved with the Kirsten family to their homestead Alphen, near Constantia, from where he undertook an eight day excursion on foot to Paarl, accompanied by Frans P. Oldenburg*. In November 1772 he was engaged as assistant naturalist by the zoologist J.R. Forster*, naturalist on Captain James Cook's second voyage of exploration, when the expedition visited the Cape in the Resolution and Adventure. Leaving the Cape on 22 November 1772, their journey took them to New Zealand, Polynesia (including Tahiti), Easter Island, and the southern tip of South America. During the 28 month voyage they penetrated beyond the Antarctic Circle in three widely separated areas. Sparrman described many plants during the voyage, which were later published by Forster and his son, but received little recognition for his contributions to the scientific results of the expedition. He returned to the Cape on the Resolution on 21 March 1775 and remained there until 11 May 1776. For four months he practiced medicine in Cape Town and thus was able to finance his own expedition to the eastern Cape, from 25 July 1775 to 15 April 1776. Traveling by horse and ox wagon and accompanied by the young D.F. Immelman, he first went to the warm spring at present Caledon, where he took the waters and collected for about a month. He then continued towards Mossel Bay and via Attaquas Kloof (near Robinson Pass) to the Little Karoo, following the Langkloof eastwards to Algoa Bay. The furthest point reached was on the Great Fish River near Cookhouse. His excavation of a stone mound in the Eastern Cape has been described as the first archaeological excavation in southern Africa (Robertshaw, 1979). Sparrman first described his journey in "An account of a journey into Africa from the Cape of Good Hope, and a description of a new species of Cuckow" in the Philosophical Transactions of the Royal Society of London (1777). The paper included the first description of Cuculus indicator (now Indicator indicator, the Greater Honeyguide), which he collected on the Great Fish River near Somerset East. During his stay at the Cape he sent plants and insects to Linnaeus, but brought many other specimens back with him when he returned to Sweden. Most of these went to the Swedish Academy of Sciences and came to be housed in the Riksmuseum, Stockholm. They include a foal of the quagga and a male blue antelope (Hippotragus leucophaeus), both now extinct. On this second visit his interest was mainly in mammalian zoology, rather than botany. He made and recorded many accurate observations and dissected and described his specimens in painstaking detail. For part of the time he appears to have made daily observations of the weather. After departing from the Cape in the Stockholms Slott in 1776 Sparman visited London for a few months to identify specimens, returning to Sweden in August. There he stayed with the great entomologist Baron Charles De Geer (who described some of his insects in 1778) while working on his collections of plants, animals and ethnographic material. 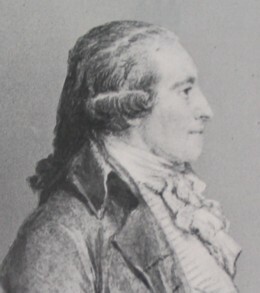 He was elected a member of the Kunglika Svenska Vetenskapsakademien (Royal Swedish Academy of Science) in 1776, serving two terms as president in 1778 and 1785. During 1777-1780 he published more than twenty papers, many of them descriptions (in Swedish) of Cape plants and animals in the Handlingar (Proceedings) of the Academy. These papers dealt with, among others, Protea sceptrum-gustavianum (1777, later renamed Paranomus sceptrum), the Honey badger (1777), Black rhinoceros (1778), Hippopotamus (1778), a supposedly poisonous gecko (1778), the Black wildebeest (1779), African buffalo (1779), Red hartebeest (1779), Eland (1779), Cape ash (1779), Bushbuck (1780), and Springbok (1780). Though most of these had earlier been described by others, he is still credited with the first descriptions of the African buffalo (Syncerus caffer and Cape ash (Ekebergia capensis). Sparrman's most important publication, which included many of the descriptions referred to above, was his Resa till Goda Hopps-Udden... (1783), translated into English as A voyage to the Cape of Good Hope, towards the Antarctic polar circle, and round the world; but chiefly into the country of the Hottentots and Caffres, from the year 1772, to 1776 (London, 1785, 2 vols). A reprint of the English edition, with introduction and explanatory notes by V. Forbes, was published by the Van Riebeeck Society in 1975-1977. It was the first personal account of extensive travels in the settled parts of the Cape of Good Hope and provided the first accurate account of the territory and its natural history. Sparrman made some interesting observations relating to agriculture and stock farming, on the effects of veld burning and overgrazing, the spread of rhenosterbos, the lack of manuring and decline in soil fertility, and the advantages of mixed farming. The book also included valuable geographical and ethnographical material and a map of the colony that was issued separately in 1779. This map (latitude scale c. 1:2 790 000), though crude and inaccurate, was the first to be printed that showed in some detail the extent of settlement at the time and contained the names of many identifiable places in the interior. It has been described as "a milestone in the history of South African cartography" (Forbes, 1975, p. 9) and was only superseded by the greatly superior map of J. Barrow* in 1801. Sparrman published an account of his journey with Captain Cook to the Pacific in two parts, in 1802 and 1818. This was a narrative account (not a journal), based partly on accounts written by Cook and the Forsters. An English translation, A voyage round the world with Captain James Cook in HMS Resolution was eventually published in 1944. His other publications included Museum Carlsonianum in quo novas et selectas aves... (1786-1789), in which he described and illustrated 100 birds from the collection of Johann G. von Carlsson (1743-1801). Earlier he had translated into English The diseases of children and their remedies (London, 1776) by N.R. von Rosenstein. In February 1780 he was appointed curator of the Academy's museum of natural history, forerunner of the present Riksmuseum. He held this post until 1798, from October 1781 with the title of professor. In 1787, with C.A. Arrhenius and C.B. Wadstr?m, he undertook an expedition to Senegal to obtain land for Swedish colonisation, but they were unsuccessful. On the return journey he visited Paris and London before returning to Stockholm in June 1788. In November 1790 he became professor of natural history and medicine at the Royal Collegium Medicum in Stockholm until 1803, when he became assessor there. A few years later he published Svensk ornithologie (Stockholm, 1806). After the Royal Collegium Medicum ceased to exist in 1813 he practiced medicine in Stockholm. His contributions to science earned him membership of several scientific societies, both in Sweden and abroad. He was a competent and likeable person during his years of scientific activity, clever and steady, though a little prim, but his life ended in poverty. He was not married. The South African plant genus Sparrmannia was named after him by C. Linnaeus the younger, while he was also commemorated in the names of several other plant and animal species. Beaglehole, J.C. (ed.) The journals of Captain James Cook on his voyages of discovery (Vol. 2). Cambridge University Press, 3 vols, 1955-1967. Brinck, P. Swedish exploration of South African animal life during 200 years. In B. Hanstrom, P. Brinck & G. Rudebeck (eds), South African animal life: Results of the Lund University Expedition in 1950-1951 (Vol. 1, pp. 11-59). Stockholm: Almqvist & Wiksell, 1955. Forbes, V.S. Sparrman's travels. South African Geographical Journal, 1945, Vol. 27, pp. 39-64. Forbes, V.S. (ed.) Anders Sparrman. A voyage to the Cape of Good Hope.... Cape Town: Van Riebeeck Society, Series II, Vols 6 & 7, 1975-1977. Hutchinson, J. A botanist in southern Africa (pp. 554-647). London: Gawthorn, 1946. Karsten, M. Sparrman as a correspondent. Journal of South African Botany, 1957, Vol. 23, pp. 43-63, 127-137. Robertshaw, P.T. The first archaeological excavation in southern Africa. South African Archaeological Bulletin, 1979, Vol. 34, pp. 52-53. Rookmaaker, L.C. The zoological exploration of southern Africa, 1650-1790. Rotterdam: Balkema, 1989. South African bibliography to the year 1925. London: Mansell, 1979 (Vols 1-4) and Cape Town: SA Library, 1991 (Vol. 5). Standard encyclopedia of southern Africa (SESA). Cape Town: NASOU, 1970-1976. Windquist, A.H. Scandinavians and South Africa: Their impact on the cultural, social and economic development of pre-1902 South Africa. Cape Town: Balkema, 1978.